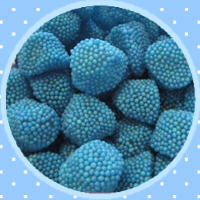 Similar to our Jelly Berries, these substantial jellies are very fruity with a lovely crunchy, nobbly candy coating. But be warned...THEY TEMPORARILY TURN YOUR TONGUE BLUE. We like to encourage school children to give these as end of term gifts for teachers! SOUR BLUE RASPBERRIES ingredients: nonpareille coating (sugar, invert sugar, glucose, gelling agent: gum Arabic; glazing agents: bees wax: citric acid), sugar, glucose syrup, water, gelatine, fructose, wheat starch, acidity reulator: citric acid; flavouring. Contains wheat and gluten.